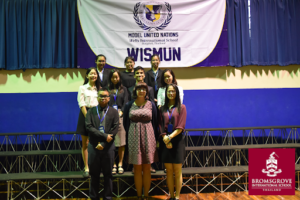 On the 14th of October, Sunday, WISMUN (Wells International School Model United Nations) opened with an assembly led by the chairs and secretary of their 4th annual MUN at Wells International School with an astounding keynote speaker called Marco Roncarati. He presented a wonderful presentation on human development. The committees present in this conference were ECOSOC, HRC, SC, DISEC, and a new committee called the African Union. After the assembly, the chairs, the delegates and pages headed to their committees. The committees were filled with long debates about the topics at hand and creating resolutions for said topics. 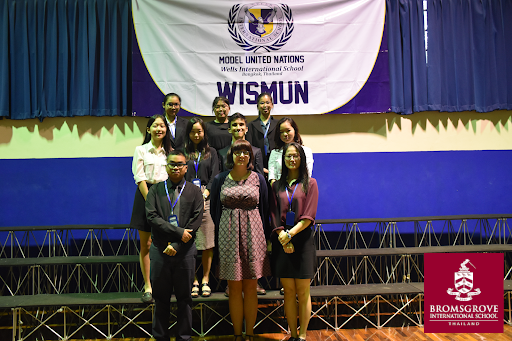 The debates were filled with interesting characters and with even more interesting speeches and resolutions created by all of the delegates present. Throughout, there were interesting debates,powerful resolutions and guest speakers. The conference started off slow and uneasy with all of the delegates and chairs settling in, but started to pick up after the first break as everyone started to feel much more comfortable and confident in their positions. Nearing the end, almost every single one of the delegates got up to speak during the conference and by the end everyone had walked out feeling much more confident than when they came in. Students in attendance in order of the photograph from top left to bottom right: Teerakan (I-tim) Churat, (Liana) Eunyul Choi, Tara Weili Koh, (Jenny) Yunseo Lee, Minjae Lee, Tawfiq Morshed, (Amy) Wen-Yu Tung, (Pump) Thanadon Teeravisut, Mrs Nagle (Advisor) and (Cathy) Yujia Zhou.